A simple and nutritious dish that is quick to prepare and delicious to eat, Keerai kootu is an oft-repeated staple during the summertime, when greens are available in abundance. Needless to say, greens are loaded with essential nutrients that are good for health; this is an easy and tasty way to serve them up. 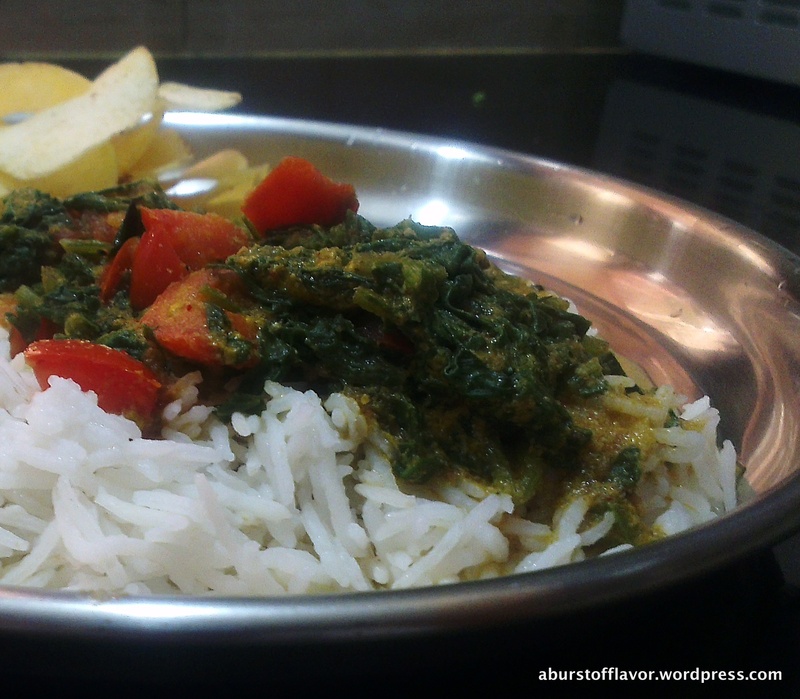 The versatility of this dish lies in the fact that you can subsitute the spinach with any other greens of your choice. Grind the ingredients in the ‘to grind’ list with little water. Keep aside. Wash and chop the spinach. Blanch the spinach in boiling water with some salt for 2 minutes. Drain and keep aside. This helps get rid of any dirt/germs that might be present in the greens. Rinse this spinach in cold running water from the tap (this will shock the greens and is said to help retain the color and nutrition). Set aside. Heat some oil in a pan and wait until it is hot. Throw in the mustard seeds and wait for it to splutter. 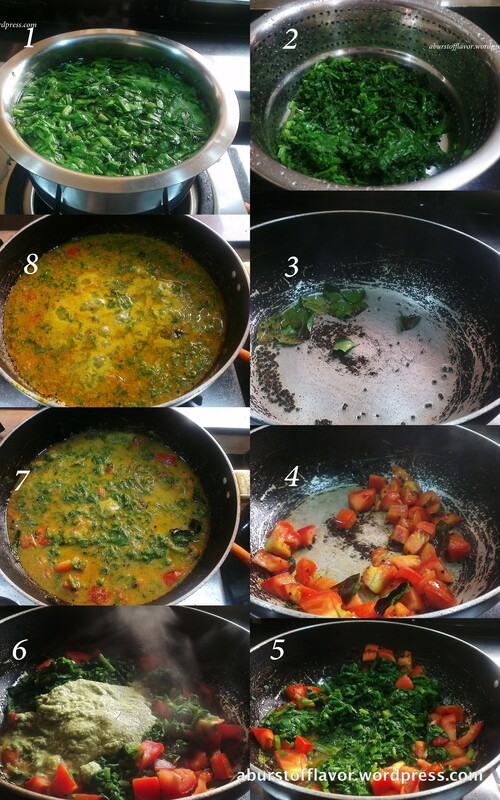 Also add the curry leaves and saute for 3-4 seconds. Add the chopped tomatoes and fry for a minute until soft. Add the washed and chopped spinach to this and saute for a minute. Add the ground coconut paste. Add some water and mix well to adjust the consistency of the gravy. Now add masala powders , salt and sugar as per taste. Mix well and let it cook covered on medium-low flame for 3-4 mins. Add chopped coriander. Temper 1tbsp ghee(clarified butter) with some hing and pour this garnish over the kootu.